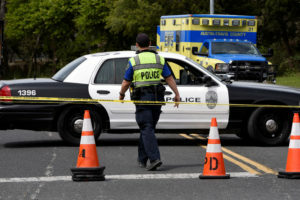 AUSTIN, Texas — A package bomb believed to be linked to the recent bombings in Austin exploded early Tuesday inside a FedEx distribution center near San Antonio, leaving one worker with minor injuries, and a second unexploded bomb was found at the same facility, authorities said. Hours later, police sent a hazardous-materials team to a FedEx facility in Austin to check on a suspicious package there. There was no immediate word about whether that package contained explosives. FBI agent Michelle Lee said the explosion happened around 1 a.m. at a FedEx facility in Schertz, which is just northeast of San Antonio and about 60 miles (95 kilometers) southwest of Austin. A worker was treated for minor injuries and released, police said. “It would be silly for us not to admit that we suspect it’s related” to the four Austin bombings that have killed two people and injured four others since March 2, Lee said. She did not have details about the size, weight or description of the package. The package was on a conveyer belt when it detonated. One worker reported ringing in her ears after the blast. She was treated and released from a hospital. Before it exploded, the package had been sent from Austin and was addressed to a home in Austin, Texas Attorney General Ken Paxton told Austin television station KXAN. Schertz Police Chief Michael Hansen said the intended target of the bomb was not the shipping facility or anyone in Schertz. The FedEx blast came less than two days after another bombing wounded two men Sunday night in a quiet Austin neighborhood. It was triggered by a nearly invisible tripwire, suggesting a “higher level of sophistication” than agents saw in three package bombs left on doorsteps, according to Fred Milanowski, agent in charge of the Houston division of the Bureau of Alcohol, Tobacco, Firearms and Explosives. Authorities have not identified the two men who were hurt Sunday, saying only that they are in their 20s and white. But William Grote told The Associated Press on Monday that his grandson was one of them and that he had what appeared to be nails embedded in his knees. Police described the men’s injuries as significant, and both remained hospitalized Monday in stable condition. Grote said his son, who lives about 100 yards (90 meters) from the blast, heard the explosion and raced outside to find both of the young men bleeding profusely. The presence of a tripwire was a departure from the first three bombings, which involved parcels left on doorsteps that detonated when moved or opened. The tripwire heightened fears around Austin, a city of nearly 1 million residents. Police repeated prior warnings about not touching unexpected packages and issued new ones to be wary of any stray object left in public, especially ones with protruding wires. “We’re very concerned that with tripwires, a child could be walking down a sidewalk and hit something,” Christopher Combs, FBI agent in charge of the bureau’s San Antonio division, said in an interview. Police originally pointed to possible hate crimes, but the victims have now been black, Hispanic and white and from different parts of the city. Local and state officers and hundreds of federal agents are investigating. The reward for information leading to an arrest has climbed to $115,000. “We are clearly dealing with what we believe to be a serial bomber at this point,” Austin Police Chief Brian Manley said, citing similarities among the four bombs. He would not elaborate, though, saying he did not want to undermine the investigation. While the first three bombings all occurred east of Interstate 35, a section of town that tends to be more heavily minority and less affluent, Sunday’s was west of the highway. The differences in location, the lack of a motive and other unknowns make it harder to draw conclusions about any possible pattern. Thad Holt, 76, said he is now watching his steps as he makes his way through a section of town near the latest attack. “I think everybody can now say, ‘Oh, that’s like my neighborhood,'” he said. The latest bomb was anchored to a metal yard sign near the head of a hiking trail, Milanowski said. Authorities have checked more than 500 leads, Milanowski said. Police asked anyone with surveillance cameras at home to come forward with the footage on the chance it captured suspicious vehicles or people. Associated Press writer Jim Vertuno contributed to this report.